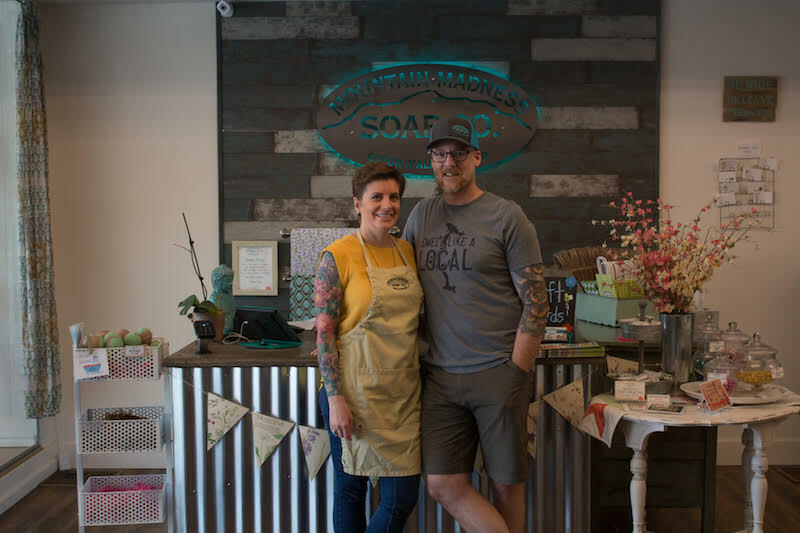 “We did farmer’s markets for seven years twice a week religiously.” Jennifer, one of the co-founders of Mountain Madness Soap, tells me as she explains how they’ve grown from her living room in Alaska. We’re sitting in the basement of their shop, a space they donate to the local Pride chapter once a week, and employees are trying to quietly travel from the storefront to the back where the soap is made. As I begin to ask them questions, Jennifer and Andy easily fill in the empty spaces of each other’s thoughts leading us into a conversation around the big-picture supply chain, standing up for what they believe in a primarily conservative environment, the importance of staying local, and how they take care of their employees. At what point did you decide to incorporate eco-conscious values into your brand? Jennifer: We’ve always been like that. It’s how we live personally, and we started very grassroots with farmer’s markets. So we understand the impact that’s made with the dollar with consumerism for small businesses. Being green and supporting local has always been our motto. I think the reason why it works so well for us is because our business model isn’t any different than how we live personally. We merge the two. Andy: We very intentionally did that from the beginning. When you own your own business, it’s pretty much all you are anyways. We wanted to make sure it was a reflection of everything we’re about, too. It can be a little tough from a business standpoint, like with the negative effects it might have with us being so transparent. Jennifer: Yeah, the bottom line is that you have to make money. If money were no object, then you could spend money on things that are more eco-conscious. But there’s not enough padding in order to make a profit, so that’s the problem we encounter. It’s very challenging from a business standpoint between making the best decision for your business and environmentally. Do you have an example of when you had to choose between making a profit and lessening your impact on the environment? Andy: Yeah, packaging, in general, is a challenge. We use plastic in some of our products, but we try to stay away from it as much as possible. At the same time, it’s a cost-effective way for us to produce a product at a price point that is palatable to the consumer. As we’re trying to switch out those things for green-friendly packaging, we’re finding it difficult to achieve a balance without jacking the prices up. And we wouldn’t be making any more money in order to achieve that. We’d keep our margins about the same. That cost would have to be passed right on to the consumer, and to the consumer that’s just too much a lot of the time. Jennifer: All of the plastics we use are recyclable. We’re always brainstorming and trying to work on new things, and we have made some packaging changes in the last six months. We’re constantly striving for that, but it’s really challenging. For instance, glass is not recycled here. You can take it, but then it’s shipped. So if we were to switch all of our plastic containers to glass, it’s more of a footprint on the planet through the shipping process or we risk people not recycling them at all. If we were to mail those as a result of online shopping, the cost also increases because it’s heavier. So then you're increasing the footprint for delivery. It becomes really challenging when you look at the whole picture and try to make that determination. How do you choose your suppliers? Andy: It’s tough to research all of our suppliers to see if they’re environmentally conscious. We might be buying fully recycled packaging -- you know the bags we use in the store are post-consumer 100% recycled and are recyclable -- but we have no way of being able to verify what the supplier’s values are or what they’re actually doing when it comes to these topics. As a small business, it’s really difficult to evaluate the entire picture continuously. Jennifer: Exactly, so we do the best that we can. I feel like we’re very educated and we’re not blindly going into anything. Whenever we can, we use completely recyclable or compostable packaging. All of our labeling is all compostable material. Andy: It’s made from pulverized stone actually, and we very consciously made that decision when we switched. Jennifer: So it’s not vinyl because vinyl has the petroleum-based element, which we stay away from. How do you get your employees on board with this environmentally conscious mentality? Jennifer: Most of them are that way naturally. People that have long-term aspirations with the company tend to be like-minded people. I think it would be difficult to work here if they weren’t. Andy: We don’t make that a requirement, but generally that’s the way it works. What other business decisions do you make that take the environment into account? Andy: We do have our own internal programs. With the downtown garbage service, you don’t get recycling, so we pay extra for that. I think we were actually the first business downtown to get recycling service. Jennifer: We also buy in bulk, like if we can buy epsom salt in twelve-pound bags that are plastic, we’ll buy the 50-pound bag that’s in paper that we can then recycle. Our packing peanuts are all cornstarch, they’re not plastic. We have a program through Pilgrim’s, the whole foods market here, we purchase their used packing peanuts. It doesn’t always sustain us. They don’t always have enough. So we have to supplement that a little bit, but the whole reuse / recycle / reduce mentality is what we try to do on an everyday basis. Some businesses buy beautiful plastic bags, and we don't do that. We buy the 100% consumer recycled craft bags, put a label on them, and then we use tissue paper to make it look nice. But we’d rather do that than buy the coated bags, the ones that get their shine from the petroleum-based vinyl. Do you have any other collaborations like that with others in the area? Jennifer: If there’s somebody local who can do what we need, we’ll even pay a little bit more. Sometimes that isn’t possible, but for example, a local graphic artist, a local web designer, and we’re working with an artist right now and a letterpress studio to do some packaging for Christmas. You know, we could order soap dishes from China for two bucks a piece but we don’t. We hire a local potter that sells at farmer’s market and she makes our soap dishes for us. It’s the same with our pine soap dishes. We try to use local artists for anything that’s an add-on product to what we make. When is it not possible for you to use local? Jennifer: Printing. There’s not a lot of printing for labels. We have all of our labels designed locally, but we have them printed with a supplier in the West. Andy: Yeah, it’s kind of regional, but with how many we order, there’s no local printer that’s equipped. We buy in such large quantities now that it gets our cost way down, too. We can’t do that here. Jennifer: We used to use someone local for printing around two years ago, but we’ve grown significantly. We don’t do anything overseas. I think it’s a global community, but I believe that if you can impact your community, that’s definitely better. Andy: The source of some of our ingredients is international for sure, but we’re buying from US distributors. We try to be conscious of that. Palm oil is a great example. We really try to be conscious of using certified, sustainable palm oil. We had to chase that down for a long time, and it turns out that it’s extremely difficult for them to trace their source all the way back to where it starts in Malaysia or Indonesia or wherever. We were finally able to get a certificate from the supplier showing that it is RSPO Certified Sustainable Palm Oil. Jennifer: And we pay more for that than we would with regular palm oil, but there is a movement right now for anti-palm. There are a lot of soap makers that are getting on that bandwagon. There are two sides to every coin, and we feel like if we’re doing it sustainably, in other words they’re planting and re-harvesting on that land, to us it’s a sustainable item that isn’t negatively impacting the environment. Andy: I just read an article on the other side of the coin, too. It turns out that per acre yield of the oil from something like palm is much much higher than from the equivalent area yield from a substitute oil, like rapeseed. So people aren’t necessary looking at that either. If we just suddenly get rid of palm oil, what are we going to replace it with, and what kind of environmental impact is that going to have? It could actually be a larger environmental impact. There’s always a new study coming out or new information to learn, so how do you stay informed in such a fast-paced, information-rich environment? Andy: We stay educated mostly through social media, articles, and blogs. It definitely takes effort to keep up with it all and to spend some time researching before we make a decision. Jennifer: We’re really involved with our industry and we’re just naturally always doing research. That’s just who we are as people. There’s always something new to learn, and if you ever think you know it all, you’re in trouble. Tell me about your collaboration with Pride CDA. We donate the space downstairs to our local Pride chapter. I’ve worked with the head of the organization, Julie, for years. We’ve noticed that the mentality isn’t as open as it is in other places unfortunately. We follow that mantra of being the change we wish to see, so we first contacted Julie because we do a bar called Same Love, and it’s the LGBT flag colors with a heart in the center. We contacted her and told her that we wanted to donate the proceeds to Pride. So it’s a fundraiser that we do. We have a lot of friends that fall into that category, and we’ve always seen the struggle, so it’s important to us that we can support that. It’s kind of scary honestly when you take a stand like that because it does directly impact your business and we had customers that have left the store when they see the bar of soap or they see our sign. Andy: We put a ‘Hate Has no Business Here’ sign up in the window in March of this year, and we were a little scared about what the potential negative impact might be, and it really hasn’t been bad. We know some people have walked up to the door, seen the sign, and turned around. Last week, we had someone who was in the store shopping with a handful of items. Their family members had a bunch of things, too. She came around the soap table, saw the Same Love bar, and said “we don’t support businesses that do this. Put everything back, kids.” They put everything back and walked out. It’s not our problem if you’re threatened by a business that supports equality. Jennifer: We’re not in your face about it. I do think you still have to be respectful. Even if you disagree, there is still room for that conversation. But we don’t budge on where we stand with equality nor will we be influenced by the negativity. Andy: We really are putting ourselves completely out there by just that sign by itself. People know that we’re progressive right away. In Idaho, we’re a minority, so we know that it can have a potential impact on our bottom line. But we’re okay with it. Jennifer: We have some employees who fall into the LGBTQ categories, and for them to know that we have their back makes a statement, too. Andy: We’re always concerned about the potential for vandalism, too. Like someone seeing that sign on a drunken Saturday night and throwing a rock through the window. It hasn’t happened, though. Our window has been spit on a couple of times, but that’s about all. Are there any other social causes you support? Jennifer: Emerge is the art collective here, and I’m on the board. It really encourages youth and adults to find what they’re passionate about. I’m passionate about the arts. I’m also on the Arts Commission of Coeur d’Alene, and we vote on different art fixtures or murals downtown. One of the other things we’re really excited about is a partnership with a nonprofit organization in Guatemala. We’re going to go to a community center in January and teach soap making to six women for about 10 days, which we hope will positively impact their community and increase their earning potential. Andy: We really hope they can continue with the trade after we leave and make a profit. The good thing is that we’re doing it under an already existing non profit, so they’ll be able to monitor, help, and translate for us. Then we’ll go back in about six months for a follow up and help them with anything else they need. We got the idea from another nonprofit we’ve followed for a long time called Lovin’ Soap. We reached out to them and told them what we were thinking of doing, and they totally embraced us. They were awesome. We had a long conference call where we asked them all kinds of questions about challenges, and they sent us documentation we could use. Have you considered becoming a Bcorp? Andy: I just started doing research on that, and it’s something we may actually apply for when we get some downtime in the new year. If we meet the qualifications, there’s certainly no harm in doing that. How do you decide when to give to a non-profit organization? Andy: We wish we could give to almost everybody. We get requests a couple times of week and more during the holiday season. It’s a tough one. We sit down together and consult each other. We do have a annual budget for charitable contributions. We tend to focus on organizations with a specific cause that are local. Jennifer: We also don’t want it to be a direct reflection of just how Andy and I feel. We also want our employees to be a part of it. For instance, Tyler, one of our sales clerks upstairs, is extremely passionate about animals. So she proposed doing a bar of dog shampoo for a fundraiser for a local animal shelter, so we did that. Arlene, our sales manager, is affected by autism in her family, so she’s very passionate about autism awareness. We always tell that to the employees that anything they’re extremely passionate about and they feel compelled to do something we’ll do it. Every year, we reflect on how we can change, grow, and be better employers, and in January, we’re going to have a conversation around setting time aside for each employee to have paid volunteer time. Andy: It’s those little things that we try to do year after year to get better. Jennifer: We want the employees to feel like there’s a sense of ownership. Part of that is that we pay a living wage, and we don’t personally profit as much because of that but we sleep better at night for it. We’re also closed on Black Friday. We joined the REI #OptOutside movement two years ago. What other socially conscious businesses do you look up to as role models? Jennifer: It’s interesting when you’re not a big consumer personally, and you own a store where you need people to purchase, but you have to set a personal limit. To me, Black Friday is just insane and the worst thing ever, so we’re not going to subject our employees to it. Andy: That one is sort of hard for us too because we’re against rampant consumerism, but at the same time we sell stuff. We want people to spend their money in places where they feel the best. You’ve consistently grown the business each year. What have you found most challenging about the growth? But what we struggle with now is that we’re big enough that people don’t know or believe that we make our products, so I think that as you grow -- even though nothing has changed from a production standpoint -- people don’t know the work that goes into it. We’re not using machines or outsourcing work overseas and then having it mailed to us. We’re making our products. So maintaining and communicating the passion of the handmade and artistry-focused product can be challenging.